This winter season, Columbia Sportswear is heavily promoting its new line of TurboDown jackets and vests, even featuring it in prominent TV ads during last week’s World Series. Besides having some marketing snazz, what exactly is TurboDown? And what does it say about the current state of goose down in general? The TurboDown sandwich: synthetic below, down above. To keep prices in check, gear manufacturers are experimenting with a growing number of hybrid insulations that combine goose down with less-expensive synthetic insulation. TurboDown, for example, takes a two-layered approach to this concept. First, a layer of Columbia’s synthetic “OmniHeat Insulation” is placed closest to your body. Then a layer of down is added over top of it. (Plus Columbia has s all those reflective dots on the inside of the jacket, which are designed to reflect radiant body heat and increase the warmth of the jacket. They probably do, if only a small amount, but that’s a subject for another post.) The end result is a suite of jackets and vests that come in at reasonable price points. Columbia is far from the only company embracing this trend. One of the more notable is Primaloft, which makes a variety of insulations used by many gear manufacturers. This season, Primaloft is launching its Performance Down Blend, which actually combines both down and Primaloft fibers into a single blend. Expect to see this and other synthetic-down hybrids in clothing from most major gear manufacturers in the coming months and years. 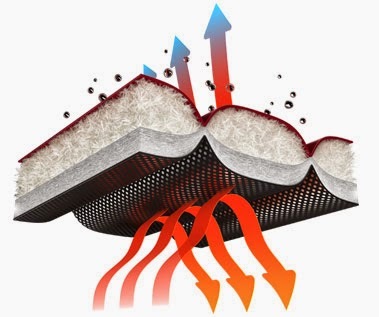 Though the primary driver of this trend is cost, it’s worth nothing that such hybrid blends do offer potential advantages in moisture management and transfer, given synthetic insulation’s superior ability to wick moisture, dry quickly, and insulate even when wet. Time (and consumer behavior and the dynamics of the world’s geese supply) will tell whether this trend fades away or puffs big in the years ahead.